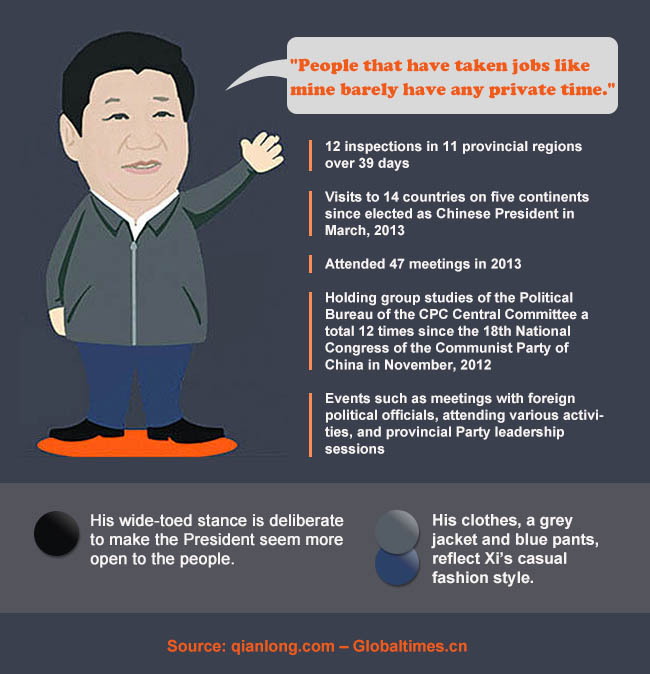 A cartoon rendition of Chinese President Xi Jinping as part of an infographic, the first such image of him carried by Qianlong.com, a website affiliated with the Beijing government, has been widely circulated online and triggered debate and discussion about the new attitude toward publicizing China's top leadership. Previously, a video titled The makings of a Chinese leader went viral online in October last year via popular video website Youku, in which China's top leadership was presented in animation. Photos and video footage of Chinese President Xi Jinping visiting a historic neighborhood in Beijing on February 25 during heavy smog has gone viral on the Internet, two months after his surprise appearance at a local eatery sparked a nationwide steamed bun craze. A video depicting China's top leadership in an animated cartoon has been played during the five-day visit of a Chinese delegation sent to Laos to promote the spirit of the Third Plenary Session of the 18th Central Committee of the Communist Party of China (CPC) since December 18, cpc.people.com.cn reported on December 20, 2013. For the original cartoon, check Where has President Xi’s time gone? President Xi Jinping's surprise visit to a fast food eatery on last December 28 in Beijing has drawn unprecedented attention, which shored up his everyman image that had rarely been seen among top-level Chinese officials in the past. Blurred photos of Xi queuing at a restaurant, holding his own plates and dining at a table were posted online by Net users first in the afternoon. The photos were forwarded by Xinhuashidian, an official Weibo account run by the Xinhua News Agency. Given no official media accompanied the president during his surprise visit to the eatery, all the photos and videos were taken by diners with their cellphones. A Sina Weibo account called Xuexifensituan, which means "Fan club to learn from Xi," became quite popular online for its real-time reports of Chinese Vice President Xi Jinping's inspection tour of Gansu Province in 2013. The account published the details of Xi's Gansu tour starting on February 3, 2013 and set itself apart by publishing close-up photos of the leader, some of which are exclusive. The man behind the account identified himself as an ordinary netizen when responding to the public's queries about his true identity, according to a report from the Shanghai-based Oriental Morning Post on February 5, 2013. Having first been registered on November 21, 2012, this account had over 480,000 followers as of 4 pm, February 6, 2013. Cartoons are a good way to present officials as everyday people. Politics are a serious subject, but politicians are regular people. China’s grassroots officials should learn from the President and try to better connect with the people. Cartoons of China’s top leaderships not only bring them closer to the common people, but also help the public better understand their political views. Cartoons of top leaders are a modern and effective way to connect with the public. They help people learn about their leader’s schedules and activities through humor. The Party and the government are seeking new ways to connect with the public, such as through Weibo and WeChat, and this will increase in the future. @小地盘无限大: The cartoon is very cute. Hope to see more. @一零六点一: I like President Xi very much. He doesn’t use a lot of official jargon during his speeches and is easy to understand.